Hartbeespoort, province North-West, is a tourist hotspot for cool people. Less than an hour from Johannesburg and Pretoria, it is blessed with a great natural beauty, agricultural abundance and a thriving artisan food scene. On Friday, 150 residents crossed the bridge of the famous dam of this small town to deliver a memorandum of demands to the local police station. The event, organized by the Community Development Initiative of Hartbeespoort, stated that #RacismStopsHere! The most immediate incentive to action was a recent violent and reportedly racially motivated assault on the National Council of Art President and Hartbeespoort resident Hartley Sandy Ngoato at the local recreational facility, the Oewer Club. Ngoato says "as a resident of Hartbeespoort, I can confirm that our society still houses people whose mindset is deeply rooted in the apartheid way of thinking, acting and doing things, which might have been a misunderstanding between a white person and myself. A black man soon became ugly and I got all kinds of inhuman names, including the K-word, from a gang of white men and women. Ngoato made every effort to point out that the attack on him was not an isolated incident and that "we must deeply engage with the ordinary members of our community who are subjected to this treatment daily, but are afraid to speak out or who do not know how to make their voices heard ". While the lawsuit arising from this altercation is pending, the march organizers argue that the incident sheds light on the ubiquitous culture of intolerance at Hartbeespoort that focuses on attempts to preserve white privilege. Tensions rose high in the city prior to the attack on Ngoato as a result of the controversial rights to the use of state land around the dam for recreational purposes. Marcher Martin Morrison said: "Hartbeespoort is in many ways a wonderful place to live, but we have to acknowledge and rectify the fact that there is no equal access – especially in taxpayer-financed and / or state facilities, land and resources. spaces are not all equally inviting to everyone, and this can not be allowed to continue. " 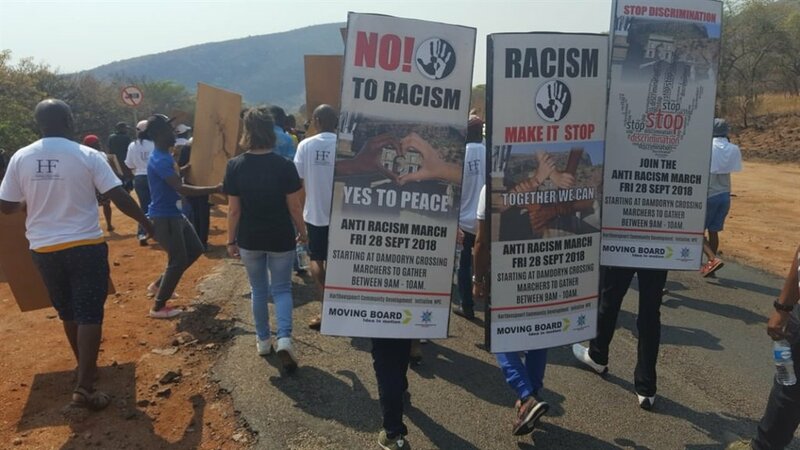 Hartbeespoort Community Development Initiative spokesman Russel Baloyi said: "We were marching to demonstrate a commitment to eradicating racism, our goal is to create a movement by residents of the city, activists, stakeholders and visitors. de Hartbeespoort Dambrug as a symbol of a movement from the old to the new … The march sends a clear message that racial intolerance will no longer be tolerated. "Racism must stop and the city of Hartbeespoort will be the focal point from which our sleepy approach to social cohesion and tolerance will be aroused.The march alone will not solve the underlying problems but will act as a catalyst for coordinated programs that are aimed at building a truly united and all-embracing country.